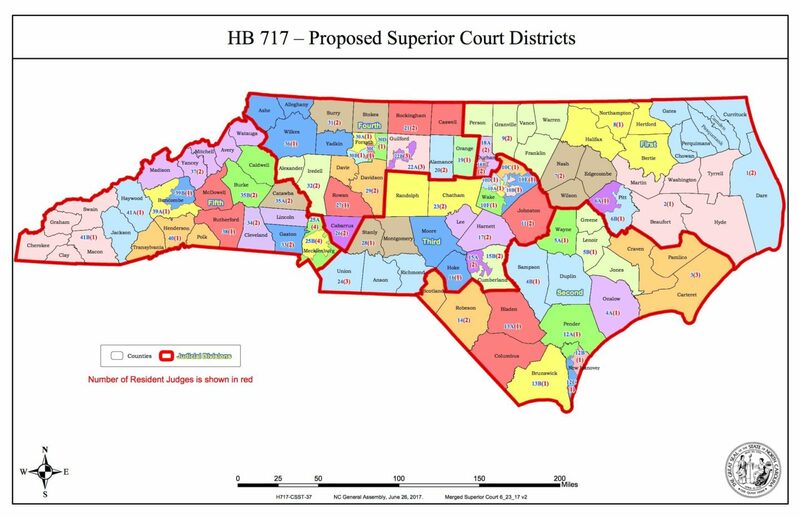 Districts for North Carolina’s Superior Court and District Courts proposed by Justin P. Burr. Image courtesy of the North Carolina General Assembly. This story was co-published with Democracy NC. North Carolina Republicans have overhauled the way North Carolinians vote and are represented by their government in the seven years since they seized control of the state legislature. Now the GOP leadership has turned its attention towards further consolidating the party’s power over the state judiciary. With the threat of a new gerrymandering bill on the horizon that would redraw the judicial districts, some jurists are worried that the Republican supermajority’s manipulations pose a long-term threat to the courts’ independence in the state. Over the past two years, Republican leaders have tried a number of tactics to shift the judiciary into their column. They shrunk the size of the Court of Appeals to prevent Gov. Roy Cooper from appointing Democrats and diluted the state Supreme Court’s power of appellate review. GOP lawmakers also reinstituted partisan judicial elections and reordered the ballot in Court of Appeals races to stack Republican candidates at the top. This change arguably made it easier for Phil Berger Jr. — the son of Senate Leader Phil Berger — to win his election last year over Democrat incumbent Linda Stephens by a thin margin. In pushing through these judicial changes, GOP lawmakers have eschewed the traditional legislative process in favor of expediting bills, which has angered some Republicans as well as Democrats. The closed-door legislating doesn’t look to be letting up either. Rep. Justin Burr, a rightwing House Republican, introduced a bill last session that would redraw the maps allocating the district court and district attorney seats. The bill was delayed, but may return in either a special session planned for October or next year’s short session. Burr faced criticism for not including input from current judges and district attorneys in House Bill 717. North Carolina Representative Justin P. Burr (R-Montgomery, Stanly), who introduced surprise legislation to reallocate state judiciary seats along party lines. Although the legislation was widely criticized and withdrawn, it demonstrates how state Republicans are attempting to extend their gerrymandered control of the legislature over the judiciary as well. Photo courtesy of the North Carolina General Assembly. But that’s the approach that the current Republican majority has favored. And if they get their way, reshaping the courts — irrespective of whether the public supports it or not —could have far-reaching ramifications for judicial independence in North Carolina. The redistricting process has long proven a successful way to shift political power — and both Democrats and Republicans alike have sought to use it to their advantage in North Carolina historically. But since winning majority control of the legislature in 2010, Republicans have deployed redistricting legislation to lock down their control over all levels of state government. Making a foray into redrawing the judicial districts, however, is a recent move for Republican legislators. Introduced this summer, Burr’s bill would have changed not only the lines of the district and superior courts, but also those for the prosecutorial districts, all of which have existed for decades. The effects on Democrats would have been palpable. For example, two district attorneys would have their posts eliminated — one position covers Scotland and Hoke counties, and the other covers Anson and Richmond. Cooper won all of those counties except Richmond, and he lost Richmond County by less than 500 votes. Burr released the new maps on a Sunday night in June. The committee hearing on them was scheduled for the next day. Some district attorneys weren’t happy with the process either. HB 717 would have affected Woodall’s district enormously. The new map would have removed Chatham County, a liberal-leaning county that both Clinton and Cooper won by double digits, from the district it shares with Orange County — one of the bluest counties in the state. Instead, Chatham’s some 70,000 residents would have been added to a district with Randolph County, which President Trump won with 76 percent of the vote last year. Given that Randolph County’s population is roughly the same size as Orange’s, Chatham County’s judiciary would likely become more conservative than its population. Woodall told Scalawag the change would have had negative impacts on Chatham. Before HB 717 could advance, the regular General Assembly session ended, but the reprieve may only be short-lived. Calling the current districts “gerrymandered and disproportionate,” Burr vowed to bring the measure back. NCCU students pose after casting their ballots in the 2016 election at a Durham County polling station. The state Board of Elections intervened last fall to keep Durham polls open later after machine malfunctions led to huge delays. Photo courtesy Democracy NC. Burr’s effort to rework the district courts comes on the heels of the GOP’s work this year to minimize the influence of Democrats on the state Supreme Court. In a surprise win for Democrats last election, a superior court judge in Durham beat incumbent Justice Robert Hunter by nearly double digits. Michael Morgan’s win gave Democrats a 4-3 advantage on the state’s highest court as the justices review a number of GOP-instigated policy changes, including the gerrymandered legislative district maps. A month after Morgan’s win, the GOP leadership called a “surprise” special session — two weeks before Cooper took office and just minutes after lawmakers concluded another session to appropriate funding to rebuild communities after Hurricane Matthew and wildfires. Over the next few days, the legislature not only attempted to curb Cooper’s power ahead of him taking office, but it also made Supreme Court races partisan for the first time since 2002. Legislators also changed the process for state constitutional challenges: previously, cases that raised constitutional issues skipped the Court of Appeals and went straight to the highest court for review. Under the new law, those cases now go first to the heavily Republican Court of Appeals, which can decide to hear them en banc with all 15 members or with the traditional three-judge panel. Former appellate judge Douglas McCullough said that change was based on a misconception of how the Court of Appeals actually operates. He said that this situation, however, is exceptionally rare. It’s not clear how this will actually work in practice. According to rules established by the Supreme Court days after the legislation passed, an en banc procedure “is not favored and ordinarily will not be ordered” unless the party petitioning for the case to be heard by the full court can prove that it is "necessary to secure or maintain uniformity of the court's decisions,” or the judges decide that the case “involves a question of exceptional importance that must be concisely stated.” Perhaps more tellingly, according to what one courts’ staffer told NC Lawyers’ Weekly, there isn’t even a courtroom at the Court of Appeals or at the Supreme Court that’s large enough to accommodate an en banc hearing. Morgan’s importance on the Supreme Court, meanwhile, should not be understated. In February, the state Supreme Court blocked changes that would have merged the State Board of Elections and the State Ethics Commission into an eight-member board with equal representation from Democrats and Republicans; previously, the governor’s party held a majority of the five seats on the Board of Elections. Democrats have called the move a blatant attempt to subvert Democratic control over the state’s election process following more than six years of GOP dominance. The state Supreme Court is now taking the issue up; given the Board of Election’s role in keeping polling stations open during the last gubernatorial election, Morgan’s vote could be a crucial one, should the 2020 election be as close as it was last year. The North Carolina Supreme Court building. The Republicans passed a bill to make the Supreme Court races partisan once more after unexpectedly losing the chief justice’s seat to Democrat Michael Morgan in 2016 — an electoral result that flipped control of the state’s highest court to the progressives. Photo by Alexis Rael. While the legislature has taken aim at both the highest and lowest levels of the judiciary, Republican lawmakers have focused their work by far the most on the Court of Appeals. Instead, McCullough says, he offered Hayes an alternative — for the legislature to raise the mandatory retirement age from the age of 72, so that he could serve out his term or serve until his successor was elected. In April, the legislature passed HB 239, a law that would eventually lower the number of seats on the Court of Appeals from 15 to 12. The measure prevents Cooper from appointing replacements for the next three judges to retire and thus keeps a solid Republican majority intact. Republicans claimed the change was motivated by the appellate court’s flagging caseload. Judge Donna Stroud, another Republican on the Court of Appeals, was dispatched to offer testimony to the House committee with “the correct statistical information” about the court’s workload, McCullough said. She spoke at the Senate committee hearing and corrected the inaccurate caseload statistics that had been cited by Rep. Sarah Stevens; the bill passed anyway. After Cooper vetoed the measure on April 21, the legislature was expected to override the veto. Before they got a chance to, however, McCullough unexpectedly retired a month early, which allowed Cooper to appoint his replacement. Cooper immediately did — choosing Democrat John Arrowood, who previously served on the court for fourteen months in 2007-2008. “I did not want my legacy to be the elimination of a seat and the impairment of a court that I have served on,” McCullough said at the time. On April 26, the legislature overrode Cooper’s veto, and the appellate seats will begin to be phased out starting with the next retirement. Republicans have used other tactics to stack the court with allies who would rule against challenges to their legislative agenda. In 2015, the legislature added a requirement that listed party affiliations on the ballot for the Court of Appeals races. The following year, another law changed the ballot order for Court of Appeals races, discarding the Board of Elections’ randomization method in favor of an ordering that would list the nominee from the governor’s party first. At the time, that would have bumped Republican candidates to the top. The legislative change might seem minor and technical, but studies have shown that being the first candidate listed on the ballot provides a significant advantage, particularly in down-ballot races where the candidates aren’t as well known. A 2016 Sam Houston State study showed that holding the first position on the ballot could raise a candidate’s vote share by at least ten percent in down-ballot races. The change came at an opportune time for one candidate. Out of the five seats up for election on the 15-seat appellate court last year, only one belonged to a Democratic incumbent, the seat held by Linda Stephens. Her opponent? Phil Berger Jr., a former failed congressional candidate whose father is Senate President Pro Tem Phil Berger, arguably the most powerful politician in the state. Berger Jr. defeated Stephens by 22,000 votes, just half of a percentage point. With Republicans holding onto the other seats last fall, the conservatives gained an 11 to 4 advantage on the state’s second-highest court, before Arrowood's appointment brought it back to a 10-5 split. While Republicans have upped the ante in recent years, Orr says that in the hundred-plus years that Democrats ran the state, they gamed the system as well. This has been particularly apparent with regard to ballot order. Republican legislators reordered 2016 general election ballots, giving a potential advantage to candidates like Phil Berger Jr., the son of the Senate President Pro Tem. Berger Jr. won by just half a percentage point. Sample ballot courtesy of the Durham County Board of Elections. Rep. Joe John, a Democrat who served on the Court of Appeals for eight years in the ‘90s and early 2000s, pushed back on the idea that Republicans are simply continuing with a bipartisan tradition of rigging the courts. Orr remained steadfast in his view that the Republicans are now returning the favor after 100 years of Democratic rule in the state. But either way, he thinks the opaque way that the current lawmakers are handling legislation on court administration harms the judiciary. The problem is not that there aren’t better methods to ensure judicial independence. Independent commissions to select judges or to redraw districts have been floated, as has returning to non-partisan elections. Orr suggested that there should be an independent financing system for the judiciary to “take the power of the purse out of the equation when it comes to the legislature and the courts.” He also suggested electing judges by panel rather than individually. Meanwhile, both Morey and John said that they plan to introduce legislation that would appoint some sort of nonpartisan commission to study how judges are selected. Most agree that the current system isn’t working. But the fact is that Republicans currently hold veto-proof supermajorities in both chambers of the legislature. There’s not much Cooper or legislative Democrats can do at this point to stop them. In the meantime, McCullough worries that what the Republicans have done with the courts over the last few years “sends a message” to judges and potential candidates for the judiciary. When it comes to today's Republican Party, superficial changes often serve to obscure more important continuities with the country's dark past.